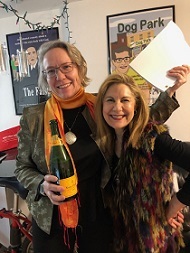 This was a better week for me because two of my students, Katie Manderfield and Lisa Maria Noudehou completed their first screenplays in 10 weeks. The stories are both great, female coming of age stories with completely different settings and different sensibilities. Both are well structured, with compelling characters, and usual arenas and strong conflicts. I am very proud of them as you can see from the pictures below. It is very difficult for us writers to let go of our material. One of the hardest things is to know when the draft is done. My writing system because it has a specific and clear method as well as a definition for what each draft should accomplish makes it possible for writers to have more control over their material. In addition to learning the method, and having talent, Lisa Maria and Katie used the most important gift: the ability to do the work. Many congratulations to both of them, and I hope that you will be inspired to hunker down and get that screen play done!